Often referred to as loping, cantering is the stage where your horse transitions from a trot, or jog, into a faster motion but does not run. A western canter is smoother than a trot and generally easier to set than the jarring trot. When your horse moves off of leg pressure and understands the stop command, he is ready to canter. Sit deep in your saddle with your hips relaxed and your heels turned down in the stirrups. Don’t tense up or sit perfectly straight, as with English cantering. Ride with both hands on the reins. Move your horse into a jog or trot. Tip his nose and keep him in a large circle while applying inside leg pressure. This helps keep him on the correct lead and more balanced, making your ride smooth. Squeeze with your calf or cue him to move into the next gear, which is the canter. Loosen your rein and give your horse some slack. If he speeds up past a canter, slightly bump the reins to slow him down. 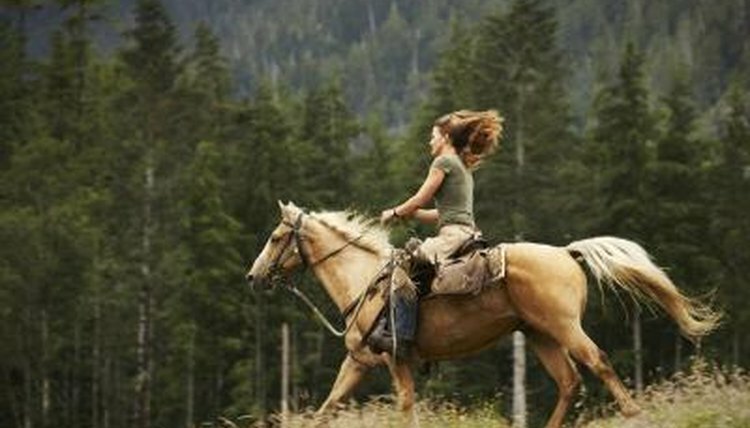 Sit in your saddle and let your head and body move freely with your horse's motion. It should feel similar to sitting in a rocking chair. Do not post, as with English riding.  Make sure your horse is on the correct lead and engaging his hips. If not, the canter will feel unbalanced and be a bumpy ride. ⚠ Never canter in a wide open area or on rough ground when starting. A large round pen or arena works well.